Article: Who Owns Your Domain Name? - better make sure its you! In the 21st century, the vast majority of businesses have their own website and email services – it has become part of a company’s identity like its brands or trademarks, logo, and product names. Most business owners understand the value of company branding and identity but too few really appreciate the importance of the domain registration and renewal processes – fewer still the possible pitfalls and problems that can arise when things go wrong! The loss or suspension of a domain name halts an organisation’s online presence – for any company that relies on its website to trade that is a devastating blow, so a better understanding of the domain registration process is important. A domain name is a business item that is obtained for a relatively small cost, but it is important to understand that you don’t actually own your domain name. 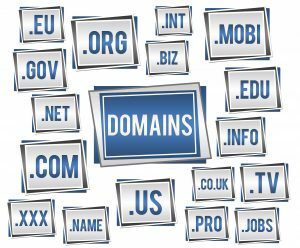 Domains are in fact leased from a Domain Name Registry (Nominet for .uk, .co.uk, .org.uk and ICANN for .com, .net and .org domains). To complicate matters further, hosting companies can act as Registrars and provide an intermediary service to register and host domain names on behalf of businesses. The key issue is that domains are registered to a single ‘owner’ or business (the Registrant) for a finite lease time (most commonly 2 to 5 years) after which they must be renewed or they will be released back for re-use, perhaps to another individual or company. There is a thriving and lucrative business arising from the detection and purchase of expired domains, with large fees charged to the original owners if they wish to re-acquire them. the business partner, friend or colleague moves, retires or even dies. the employee resigns and changes job or is dismissed. the part-time Contractor goes out of business or changes career. If a domain has not been properly registered, any of these situations leave the company facing the possibility of no longer being able to access the online domain management tools, renew its own domain name or even access the process by which to renew it! Domain Registrars will only communicate with the individual whose name appears on the registration and they are unlikely to intercede in the event of any dispute between interested parties. If they do have to get involved with a registration dispute their costs can be substantial and the delays significant, so it’s far better to ensure that the registration is secured and remains trouble-free. What do businesses need to do in order to protect their domain registration? 1. While it is sensible to have an IT partner to manage the day-to-day support of your domain and associated services, you should make sure that your business is the Registrant for your company domain. Your IT support partner or in-house Webmaster/IT role can be assigned as Technical Contact (one of the four contact points in domain registration). 2. Ensure that the information in your domain registration is accurate and up to date. Keep this information secure – like all personal data it is valuable! 3. Ensure that you have a copy of any login username and password that is used to manage your company domain services. If you change your IT support partner, you need to be able to pass on the details to any new support company. 4. Keep track of when your domain registration and web-hosting contracts expire. Ensure that they are renewed in good time or you risk losing your registration to another individual or organisation. There are automated services dedicated to tracking the expiry and release of company domain names, selling them on for profit. 5. If you find that you or your company is NOT the Registrant for your domain, get in contact with the individual or organisation concerned and ask to have the domain registered under your company name. If they will not comply, you might need to take legal action (there is a formal legal process that deals with such disputes: the Uniform Domain-Name Dispute-Resolution Policy). Make sure your company domain is properly registered or you risk having this important part of your business identity lost or hijacked. If you are unsure about your domain, hosting or email registration or if you would like some advice or maybe even an audit undertaken, then please do get in touch either by clicking the button below, completing one of the Callback Forms on the website or by following the link to the ‘Contact’ page.